I went to see this today at the behest of several people. One was my friend Stevie who is a girly girl and as such likes these fairy princess sort of things. But the other was my friend Peter--who's more into Quentin Tarantino and 300 and stuff like that. So I figured it couldn't be too saccharine if it appealed to both Stevie and Peter. I have to say that I did enjoy it--mostly for the beguiling and unaffected performance of the hero Tristan played by Charlie Cox. Michelle Pfeiffer was very good as the evil witch Lamia--and you've got to give her props for the makeup. She spent more of the movie looking hideous than looking her usual gorgeous self. De Niro continues with showing his lighter side. I guess after Jake La Motta, Travis Bickle, Vito Corleone, Al Capone, Max Cady, etc., he is more than ready to shed the heavy. Rupert Everett and Peter O'Toole's appearance were both far too brief. As is Sienna Miller's--but thank God for that! Claire Danes did little more than look lovely. Ricky Gervais was, not surprisingly, a hoot. This fantastical fairy tale about a young man who finds a fallen star and ends up on a wild chase to bring her back to his village while protecting her from homicidal princes, evil witches and prancing pirates is loaded with action and special effects. It is definitely a feast for the eyes, although ultimately it has the consistency of cotton candy--a sweet confection with no real substance. It gets bogged down a bit in the middle when the characters have a brief respite from being pursued by the villains to learn how to sword fight and dance the waltz on Captain Shakespeare's (De Niro) flying ship, but for most of the story it moves along quite well. 1. The release date--it seems more appropriate as a winter holiday movie than summer blockbuster fare. 2. The promotion--there was very little that I noticed. 3. The genre/content--it's really neither fish nor fowl. On the one hand, the fairy tale fantasy qualities would lend itself to be marketed towards a family audience. On the other hand, there are scenes that are fairly intense and violent (fratricide, stabbings, decapitations, animal mutilation) that would not be advisable for the Pixar kiddie movie crowd. 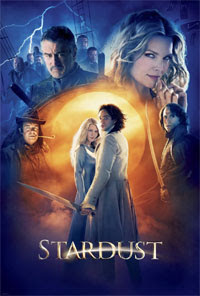 Anyway, if you're a fan of Harry Potter or LOTR or The Princess Bride, you might enjoy this movie. If you can't see it at your local multiplex, I'd add it to the Netflix queue when it comes out on DVD. Loved the movie. It was effortlessly beguiling. Tristan was such a great role. Michelle Pfeiffer was amazingly great and yes the makeup on her -- kudos to the artists. The dad and the mom characters were sort of afterthoughts.. DeNiro was HYSTERICAL and it is a movie well worth watching-- as much as I watched Quentin and the 300 too. Yes I have eclectic tastes. Daniel Craig is better as Bond than most.